I am not a jam maker. (Not always true.) It’s funny, isn’t it? I love to spend hours and hours on cakes but can’t be bothered to make such a simple food. One reason probably is that we don’t have a garden and that we buy our fruits at the store. Usually in quantities that we can eat in a day or two. Also, I have always been afraid of jam making. I remember that my grandmother canned cherries in a huge pot and all that hot water used for sterilizing and canning scared the heck out of me when I was a kid. Super silly, I know. Also, jams are usually vegan. I can buy a boatload every day. Plus, I think jam making is complicated. Case in point: the sugar discussion below. In Germany there are canning isles at the supermarket. It’s intimidating. But then fig season started. Of course all figs we get in Germany are imported and the season is super short. So every year I stuff my face with all the figs I can find. While buying figs I also realised that pomegranates already seem to be in season. I’ve always associated these with winter, just like oranges. Some things are available all year round, but they don’t really taste that great out of season (oranges again). The pomegranates at the store were all so shiny and red that I couldn’t resist buying some. And it turned out that they are much better now than in winter! Both the figs and the pomegranate were sitting right next to local plums. And what a great colour scheme they made. I immediately saw a picture like this in my head. And then I saw them all together in a jar. Both figs and plums can easily be canned. The have to be diced and that’s it. 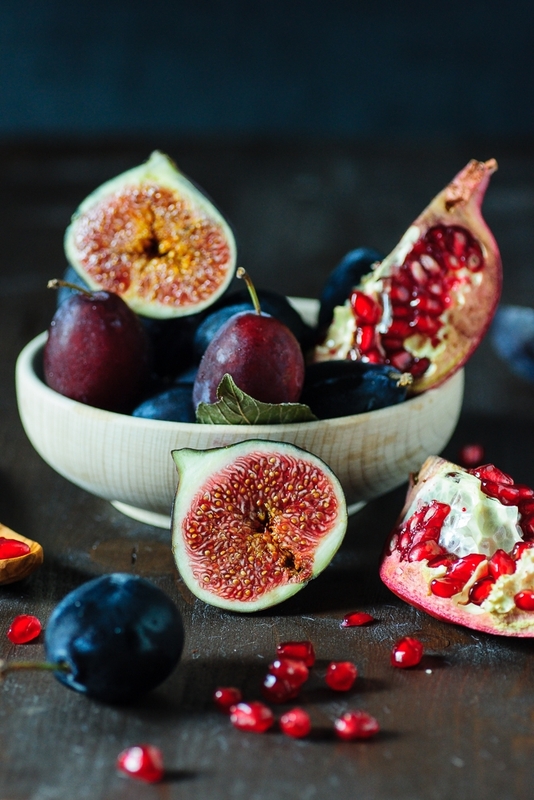 While I really love the crunch of fig seeds, I am not so fond of the pomegranate seeds, at least not in a jam. But that problem can be solved most easily. Place the whole seeds in a food processor and pulse until most of the juice is released. Pour through a sieve and press out some more juice with your hands. Done. 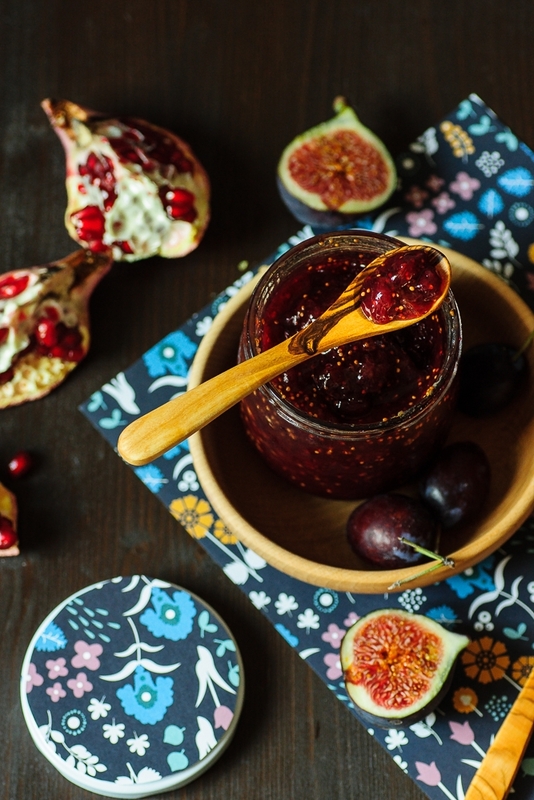 For this fig, plum & pomegranate jam I also used ground dried lemon peel (You can find the recipe in my Instagram feed.) and ground vanilla.Both ingredients are optional but they make the jam so, so good. I love vanilla in jams. It gives them a special little something. When you make jam, you usually use the same amount per weight of sugar and fruit. Doesn’t get any easier. And although some people might not believe that sugar can be useful, sugar preserves the jam. The more the better. If you make sugar-free jam, that stuff will grow mold faster than you can say baby food. (i know, I know. You can freeze it. But still. I want sugar.) On the other hand fig jam can get too sweet pretty quickly. At least for my taste. And that’s why I used gelling sugar instead of regular sugar. When it comes to making jams, Germans have a couple of different sugar options: regular sugar or three kinds of gelling sugars. They all contain sugar and pectin. Pectin is also found in every fruit and his responsible for the whole gelling thing in the first place. Because these days most people want to use less sugar for their jam and still want it to be shelf stable, gelling sugars often have additives such as citric acid and sorbic acid. Organic gelling sugars come without those. For my jam I used an organic sugar that called for two parts of fruit and one part of sugar. If you don’t have access to this kind of gelling sugar, you can do a couple of things: 1. Increase the amount of sugar. Same amount in weight as fruit. 2. You can add lemon juice to improve the acidity or you can cook the jam longer to release more pectin. 3. Buy some pectin and add some to the batch of jam you are making. 4. Make the jam as is. It will probably be runnier but it should still taste well. Dice the figs and the plums. 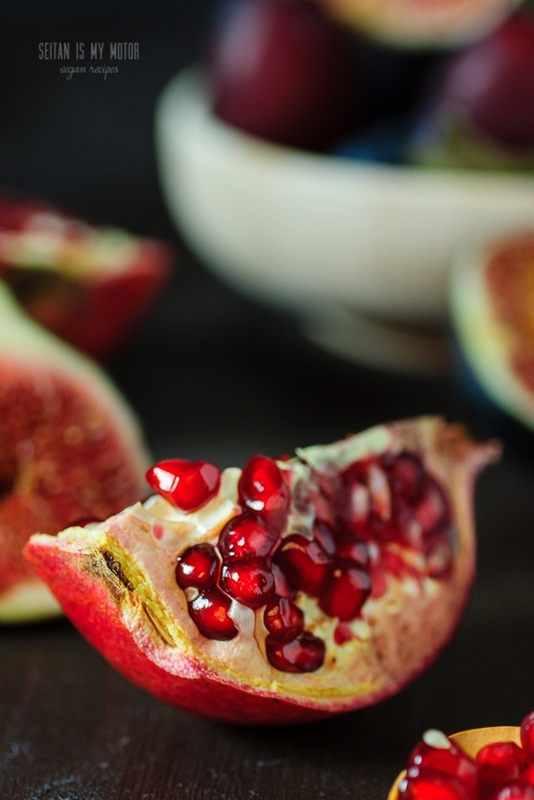 Place the pomegranate seeds in a food processor. Pulse carefully until the juice is released. Pour the juice into the pot as well. Add optional lemon peel and vanilla. Bring to a boil and cook for 10 minutes. Stir from time to time. Carefully place the jars on a kitchen towel right before your jam is done. Fill the jam into the hot jars and seal them with a lid. Let them stand upside down for five minutes, then turn them around. Let the jam set in the fridge over night. We don’t eat it often enough for me to bother with making it but wow, these photos have changed my mind. My husband loves fresh figs and while I enjoy them in things, I’ve never gotten a taste for them fresh. (sorry, bad pun) I think this would make us both happy. This looks absolutely beautiful. 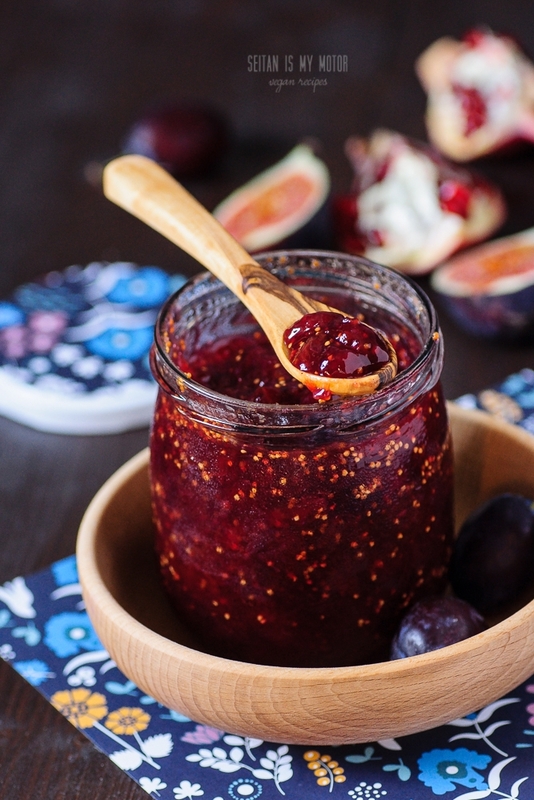 Fig jam was always my favourite growing up – my Granny had many fig trees on her farm (as well as mulberry bushes, strawberries, blackberries and more) so she used to make a lot of jam. One of my favourite memories was when she would give my mum and dad jars of jam, but she would fill some of those tiny hotel jam jars for my brother and I so we had our own little special jam. I love the sound of pomegranate and plum in there too. I have never been much of a jam maker, I should get my Granny to give me a lesson! Wow, I wish figs would grow in Germany! Also, yes! Ask your granny. Mine always gives great cooking and baking advice.